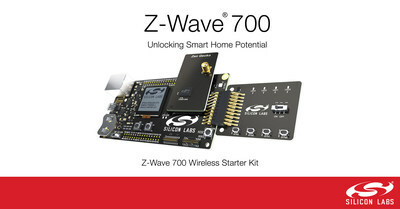 Silicon Labs launches Z-Wave 700 on the Wireless Gecko platform, unlocking the potential of the smart home. AUSTIN, Texas, Dec. 12, 2018 /PRNewswire/ -- Silicon Labs (NASDAQ: SLAB) launches the next-generation Z-Wave® 700 on the Wireless Gecko platform, the industry's most comprehensive hardware and software connectivity solution for the Internet of Things (IoT). Z-Wave 700 delivers on Silicon Labs' vision and platform integration roadmap following the company's strategic acquisition of Z-Wave technology in April 2018. The new smart home platform builds on Z-Wave's industry-leading S2 security and interoperability by improving energy efficiency and adding higher performance, longer range RF capabilities. By leveraging the Wireless Gecko platform, Z-Wave 700 enables developers to create new classes of smaller, more intelligent smart home products at a lower cost and faster time-to-market. Silicon Labs offers a wide range of development tools to enable easier, faster smart home product design. Developers benefit from low-cost developer kits, energy profiler tools and ready-made gateway software with certified reference code, minimizing the time from prototype to final product. Developers can also use Silicon Labs' Simplicity Studio development suite for one-click access to all the software tools they need to simplify Z-Wave 700-based designs. Note to editors: Silicon Labs, Silicon Laboratories, the "S" symbol, the Silicon Laboratories logo and the Silicon Labs logo are trademarks of Silicon Laboratories Inc. All other product names noted herein may be trademarks of their respective holders. Z-Wave® is a registered trademark of Silicon Labs and its subsidiaries in the United States and other countries.